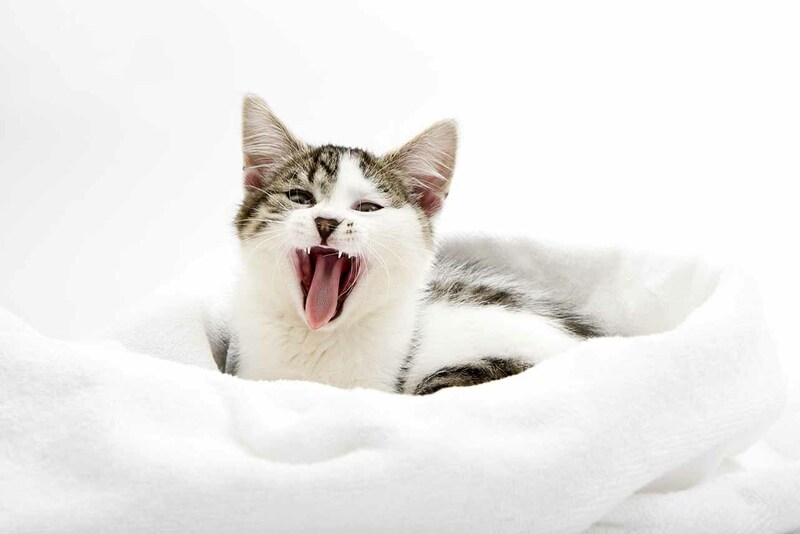 Teething begins in kittens around two weeks of age, however, it seems most people will refer to kittens as teething when they are cutting their second set of teeth (permanent teeth) at around four months as this seems to be the time when these behaviours are most noted by pet owners. A kitten who is teething may seek out dangerous objects to chew if there are no alternative and appropriate toys to use. To prevent accidental injury from destructive chewing, cover electrical cords and wires with protective plastic covers. These can be found in pet or electrical shops. Other preventive methods can include applying a bitter pet deterrent spray on electrical cords/wires and other dangerous objects, along with double-sided tape to deter access to these areas. Pack any loose items including thread, yarn and needles away in closed containers so your kitten cannot ingest these dangerous materials, and rehome any toxic plants (including lilies). Do not use your fingers as play objects, as this will only encourage biting in the long run, and also cause you quite some pain! The best thing for teething kittens would be to feed wet kitten food alongside dry. Be sure that you have plenty of various toys prepared that are differing in texture, material, size and shape. You will be able to purchase toys that are specifically made to help your teething kitten, so it may be worth investing in a couple of these. When your kitten is teething use these toys to encourage play behaviour and avoid toys with excessive 'ornaments' that may be accidentally ingested such as feathers, string/yarn and buttons.